He should have received the Nobel Peace Prize. Instead, he spent 18 years in solitary confinement. He should be celebrated internationally as a man who has sacrificed his freedom for the truth and for the wellbeing of humanity. Instead, he has been stripped of his right to travel and prohibited from talking to foreigners. Today, Mordechai Vanunu, the Israeli nuclear whistleblower, is almost forgotten. But he has not given up the fight for freedom. 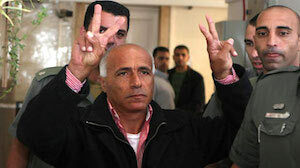 Vanunu is appealing to the Israeli Supreme Court to set him free – free to leave Israel, the Times of Israel reports. “I don’t want to live in Israel,” he told the court in English – he won’t speak Hebrew while imprisoned inside the Jews-only state. Vanunu, who converted to Christianity in the 1980s, told the court that he is often subjected to harassment by the Israeli public whenever he is recognized. Blaming the media for wrecking his public image, Vanunu said he didn’t see a future for himself in the apartheid state. Vanunu compared his past actions to those of US National Security Agency whistleblower Edward Snowden. Vanunu is prohibited from visiting foreign territories, including the occupied West Bank and embassies within Israel, and can only meet with foreign nationals after securing permission from security forces. In 1986 Vanunu leaked details of Israel’s military nuclear programme to The Sunday Times, blowing the cover off Israel’s so-called “nuclear ambiguity”. It is unlikely that Vanunu’s plea for freedom will be accepted. That is hardly surprising – the Jews-only state is a vengeful entity, Old Testament style. But where are the international human rights warriors? We hear none speaking for Vanunu. Their silence is not just deafening. It is criminal.